I’m not even gonna type in this one. I’m just gonna compile the words of a bunch of people much smarter than I.
It’s true that agave nectar has a lower GI value than table sugar, and some studies found diets rich in foods with low GI values can prevent diabetes, obesity, and cardiovascular disease. However, it’s still equally important to look at other factors in the diet: total carbohydrates, fiber, protein, and fats, exercise habits, eating style, stress level, and so on. Plus, agave nectar is 90% fructose. If excessive fructose is causing our obesity, diabetes, and metabolic syndrome epidemic, then agave might be worse than high fructose corn syrup (55% fructose) and worse than table sugar. Fructose doesn’t stimulate insulin release and as a result, doesn’t stimulate the release of another hormone that makes us feel full. So when we consume too much fructose, we are likely to eat more! Plus, fructose goes to the liver to be broken down, and there it is converted to fat, which can raise cholesterol and triglycerides. Bad stuff. Read this article from Diabetes Health for more on fructose. And let’s not forget that agave is still nutrient-free. Most agave syrup has a higher fructose content than any commercial sweetener — ranging from 55 to 97 percent, depending on the brand, which is FAR HIGHER than high fructose corn syrup (HFCS), which averages 55 percent. It is important to understand that fructose does not increase insulin levels, which is not necessarily good as what it does do is radically increase insulin resistance, which is FAR more dangerous. You see, it’s okay for your insulin levels to rise, that is normal. You just don’t want these insulin levels to remain elevated, which is what insulin resistance causes. In addition to insulin resistance, your risk of liver damage increases, along with triglycerides and a whole host of other health problems, as discussed in this CBC News video about the newly discovered dangers of high fructose corn syrup. The study discussed in this news report is about HFCS, however, it’s well worth remembering that agave contains MORE fructose than HFCS, and in all likelihood, it’s the FRUCTOSE that is causing these severe liver problems. Although the industry wants you to believe that agave nectar runs straight from the plant and into your jar, nothing could not be farther from the truth. 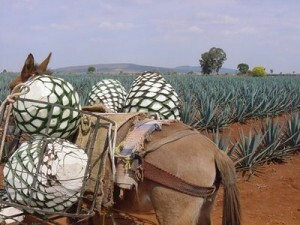 In spite of manufacturer’s claims, most agave “nectar” is not made from the sap of the yucca or agave plant but from its pineapple-like root bulb. The root has a complex carbohydrate called inulin, which is made up of fructose molecules. The process which many, if not most, agave producers use to convert this inulin into “nectar” is VERY similar to the process by which cornstarch is converted into HFCS1. The result is highly refined fructose syrup, along with some remaining insulin. Most agave “nectar” is neither safe nor natural with laboratory-generated fructose levels of more than 80 percent! Those who wish to use agave nectar as a safe natural sweetener should select raw, unprocessed agave nectar that is free from impurities. Look for USDA Organic certified agave nectar, and read labels carefully. Never buy agave nectar that isn’t grown, harvested and manufactured in the United States. I think the point about diabetics is one of the most interesting to me, because lots of diabetics cling to agave nectar for their “sweet” taste. There are safe ways to enjoy “sweet” that aren’t so nebulous. Just have to do a little digging. I think that what posts like this reinforce, for me, is to do what I can to get my “sweet” from natural sources, because the further away from “natural” we get, the more problems seem to arise. As with anything else, strive for as few excess chemicals in your products, agave included, and if it’s pricey then use that as an excuse to pare down your use of it. As with all other things, your body will thank you for it! Is There Enough Fat-Shaming In The Black Community? I started ‘dialing down my sweetness acuity’ 3 years ago and when I have desserts (made by others), they strike me as overly sweet. I’ve also discovered a range of sweetness in things that I’d have ordinarily missed because my tastebuds had been so inundated. BTW – love your blog! As a diabetic really this info about how agave sweetner is made and produced and what it ultimately does is disgusting to me. People are trying to change over to this sweetner and I, well I too got sucked in. Trashing it all as soon as I get home. In a lot of all natural products from Whole Foods to the section in your local grocery store this sweetner is added. I want to know why in the heck did they stop using the beet sweetner anyway? Most folks like myself get my sweet items from these natural food aisles – paying the exorbiant prices in an attempt to do better. Everyone keeps talking about the epidemic of diabetes and obesity and just reading this and knowing when I got it, I knew then like I know now that there is much more going on and losing weight was not the end all be all that the doctors claim it is. This is just confirmation that I MUST check out/research what is in my food for myself. I got this disease while going to the gym, working out for an hour 4 days a week and losing 54 lbs. When I got out of the gym I would grab a sandwich of some sort, eat some fruit & veggies, and when I had a sweet tooth munch on some of the of the sugar free, alternative sweetners etc. products to keep off of the regular sweets aisles. Diabetes runs in my fam so I was doing all I could to avoid it (only had a 5% chance to avoid it). I am becoming more and more aware that the food industry has done so many folks like me much more harm than it will ever acknowledge with all of this food creation trickery. This agave sugar thing means that someone who is borderline and thinking that they are being healthy can be pushed over the edge with these products because agave sugar keeps the blood sugar level high. The FDA sits back and says NOTHING about this but everyone screams regularly about weight loss and more people will feel like they failed though they lost the weight and get this disease anyway. Somebody is eating this stuff and their doctor is putting them on more pills, shots etc. and they are thinking that they are horrible and should just stop trying – they should just eat/do what they want and accept the consequences. Do you have any idea how much depression makes this disease worse? It ups the sugar level by 20 – 50 points. Yep, I am pissed about this. This disease is not a joke at. all. and this game the food industry is playing will take limbs, organs, mobility and lives of folks who are attempting to do what they think is right by grabbing a product made with agave sugar and other sugar elevating ingredients. Nikita,and anyone else with diabetes,please watch Reversing Diabetes in 30 Days with Gabriel Couzens M.D. Diabetes is not a disease but rather a consequence-like being drunk. You can’t medicate your way out of either condition. You must change behaviours,especially eating. Also look up Dewayne McCully on YouTube. He was diagnosed with diabetes but “cured” it by changing how he ate. I know this is an old post but you took the words right outta my mouth. Every thing you said is true. The food industry, FDA, and pharmaceutical companies all want us to get sick and remain sick. I’m in exactly the same boat and type 2 turned to type 1. Did alot of research and believe the food industry to be the culprit. Working on trying to reverse this but not easy, cause you dont know what to eat!! Well dang…………………..I guess i’ll pouring mine down the drain when i get home! So….this is a heart breaker for me. So……what are better sweetener choices?? Stevia (the raw leaves, not the powder packets), demerara sugar… anything as minimally processed as possible. I would like to hear your thoughts on Coconut sugar. Personally I am not interested in Stevia. Coconut sugar though has really peaked my interest. Thanks for the clarification, Sister Erika. I have used the stevia packets in the past and I am not too fond of stevia. I am a regular user of organic Wholeome Sweeteners organic amber raw blue agave. According to the label, it is a product of Mexico. Thanks for the clarification, Sister Erika. I have tried the Stevia packets, and to me they taste like Sweet N Low. I use organic raw amber agave by Wholesome Sweeteners, as I am vegan. I use it once a day primarily with my morning tea. Now where would I get stevia plant? I only bought my Agave Nectar because Dr. Oz recommened it. Oh well. Your blog is awesome Ericka. I read it all the time, and my house is in the process of converting to clean eating as much as we can. Where the heck would a person get stevia leaves from anyway? Is there an argument against honey? I live in the Caribbean and I think I hit the jack pot when I went searching for honey in the supermarket and found that there is a local producer who bottles it and provides it to the supermarkets and while it’s a bit expensive I’m thinking about sticking to it and leaving dem American manufactured ones alone. Seems like everything processed has some evil cover up behind it! Honey is the same as sugar. The only difference is that local honey can aid in reducing pollen allergies. Hi Erika, someone was asking about coconut sugar, do you have any info. on that-as far as whether it is good to eat or not, I’m thinking of getting some too!. Let us know please, I really dislike the taste of Stevia. I just bought some organic agave nectar today (2nd bottle and not the raw kind). I’ve been using it in my homemade protein shakes. I am starting to feel slightly discouraged on shopping for healthy sweeteners. I tried the Stevia packets and didn’t like it. I got Truvia and hated it. I tried Organic Honey and didn’t like it. I got Splenda and loved it, but read that it was bad on this site. I thought I had finally found a good sweetener and now I hear that it could be worse than HFCS. Maybe I’ll try Demerara next. I just can’t imagine eating unsweetened oatmeal. 2) Splenda is MUY bad. MUY. 3) Ever consider sweetening your oatmeal with maple syrup? 4) Stop expecting your “sweet” to taste the way it did with regular white sugar. That kind of sweet is an aberration, and you want… need… to let that go. I guess I do expect my sweeteners to taste like regular sugar, which is why I’ve been mostly unsatisfied with the ones I have tried. I do like Maple Syrup, The price usually discourages me from buying it though. But I have cut down on using sweeteners. I’ll give it a try. I guess it wouldn’t hurt to find proper stevia and give that a try to. I knew it! Yeah, you can’t do that. LOL Let THAT kind of sweet go, mama. That’s gone. Wave bye-bye to it.